Travel + Leisure and Food & Wine traveled the United States in search for the most fascinating neighborhoods with top restaurants and shops. They discovered 10 local areas with makers, entrepreneurs and artists who were coming together to embrace their unique cultures and style. 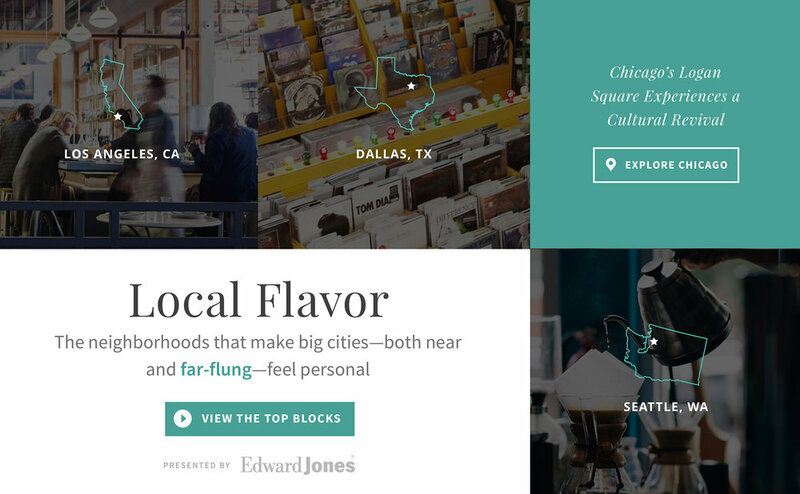 Through this Local Flavor website design, I joined forces to put these top 10 neighborhoods on full blast as must-visit destinations. The internal agency within Meredith Corporation, The Foundry, has a vast network of channels and platforms in which they create custom experiences for their brands to connect with their consumers. Travel + Leisure and Food & Wine partnered up (in addition to the sponsor, Edward Jones) to create this discovery and informational website which promoted top destinations across the map. Through extensive coordination with The Foundry and these 3 brands, I designed this micro-site to allow users to read about these destinations directly here, while also harnessing opportunities to take a deeper dive into the parent websites. I was really inspired by the distinctive personalities of each city. This led me to take a nonstandard approach to the design layouts. The results of this overall initiative showed that many users successfully converted to the parent websites through strategic entry points, which significantly increased engagement on Travel + Leisure and Food & Wine’s destination pages. This was a primary goal we reached in this initiative.